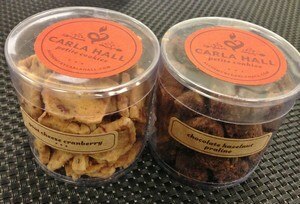 Accidental Locavore: 9 Ways Carla Hall Was Great at DeGustibus! 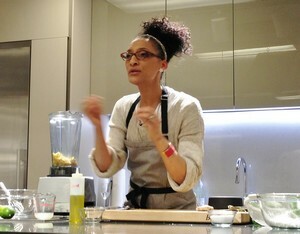 9 Ways Carla Hall Was Great at DeGustibus! The menu was international and eclectic. 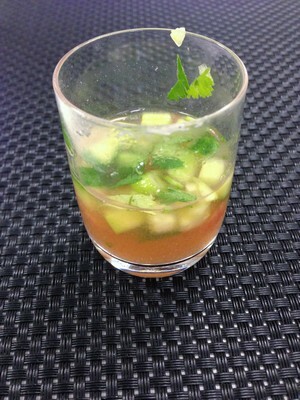 In four courses we covered Spain, Greece and the US, along with Asian influences. The menu consisted of gazpacho, cauliflower steaks with olive relish, fried chicken marinated in Thai spices along with an Asian noodle “slaw” and baklava for dessert. At first I questioned the inclusion of gazpacho, especially when the pallid tomatoes on the prep board just made me yearn for August, but she made it taste great by highlighting other (less seasonally sensitive) ingredients, including some fabulous looking fennel. I learned something. Actually two somethings. First of all, when you choose peppers, on the base end of the pepper they have an innie or an outie. The ones with the outies have less seeds (leading to faster prep). 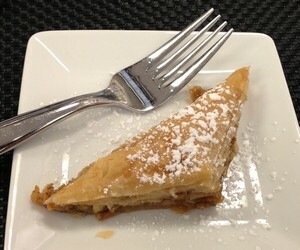 The second thing came when Carla was preparing the baklava for dessert. Instead of brushing the sheets of filo dough with butter, she sprayed the sheets with an olive oil spray. If you’re thinking olive oil Pam, fuggedaboudit, she prefers an organic olive oil spray from Whole Foods. She’s really high energy, funny and as you can see from #4, has a great sensibility about things. If I wasn’t so busy eating, I would have been able to write down some of the many funny lines that got bandied about. 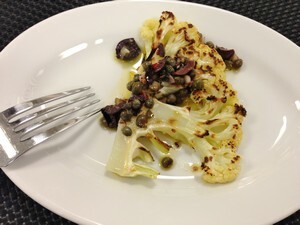 When she roasted the cauliflower steaks, she coated the baking sheets with olive oil and sprinkled that with salt. It’s a great idea, because as she said, you don’t have to worry about turning them and seasoning them on both sides. I’m definitely going to try that the next time I roast veggies. 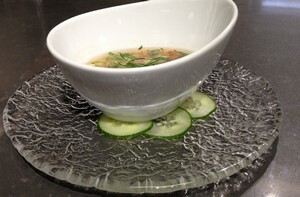 Another easy trick Carla used when she plated the gazpacho is to put some thinly sliced cucumber (I’m sure zucchini or similar vegetables would work well too) between the plate and the bowl to keep the bowl from sliding around. Her take on baklava was a big hit with the audience. In it she used three different nuts, walnuts, almonds and pistachios and instead of rose water, she used an orange-infused syrup. I have to take the word of the person sitting next to me, who eagerly scarfed down both her serving and mine (I’m allergic to nuts). She gave us all two types of her new Petite Cookies to try and take home. What a great idea! Really mini cookies that pack a flavor punch in every bite. Perfect for when you just really want a taste of something sweet. All in all, a fun, delicious, inspiring evening! If you want, all the recipes are in her latest book: Carla’s Comfort Foods: Favorite Dishes From Around the World. Many thanks to Sal and the DeGustibus staff for inviting me. And a quick note to Carla, the French word for smothered is étouffe. I wish I could have written and eaten, I missed a lot of her great one liners! The 9 Ways are so special that we foodies would love to read 9 more — or even 8 or 7!!!! Next post: What to do With London Broil?